You are here: Home / Blog / Blog / What were the Problems in the Corinthian Church? What Happened to the Church at Corinth? Paul’s first epistle to the church at Corinth reads like a Christian website’s FAQ page. In many ways, 1 Corinthians is the answers to some of Christianity’s frequently asked questions. While reading the book, it appears that Paul is answering a series of questions. It’s possible the Corinthian church had sent a list of questions to the man who had spent a year and a half planting and nurturing the new church. The structure of 1 Corinthians moves systematically from one topic to the next. Paul answers each topic, sometimes with strong admonishment. He realizes there is some trouble within the church. So what were the problems in the Corinthian church? To better understand the church at Corinth and the text of 1 Corinthians it is good to have the context of the city and people Paul was writing to. These people brought a lot of societal and cultural baggage into the church. The city was a cosmopolitan city. It sat on a small sliver of land between two bodies of water. People from all over the Mediterranean world converged in Corinth. Goods were brought into the city by ship. Sometimes the ships were pulled across the land to the other side where they would sail on. So there were all kinds of people in the city. They brought their own religious beliefs. The religious background of Corinth was a mix of Greek, Roman, and Oriental. There was very little understanding of the ways of this new religion in town, Christianity. The Christian teachings went against the grain of everything they knew of religion. Corinth was the home of the temple of Aphrodite or Artemus. She was supposed to be the goddess of sensual love and pleasure. It’s been said that one thousand temple prostitutes served at the temple. Even in the morally corrupt society of the Roman Empire, Corinth was known for it’s excessive moral decay. The word “Corinthian” was used by the Romans for someone who was immoral and excessive in that immorality. Corinth was the sin city, the “Las Vegas” of the Roman Empire. The shipping trade made many people rich. But there were many more poor people in the city. There was a chasm between the two groups. These people did not socialize with one another. It was within this atmosphere and context the Corinthian church was born. 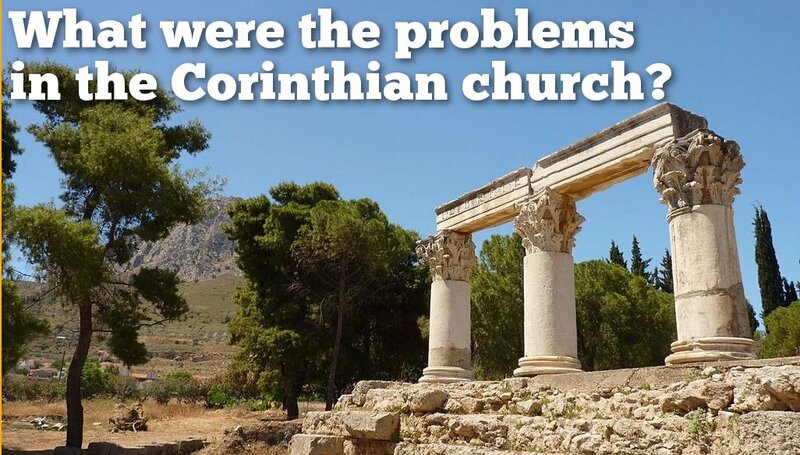 The church at Corinth had many problems. But all of the problems stemmed from one central problem. The people could not or would not detach themselves from the world they lived in. They were having problems shaking off the ways they lived before they were introduced to Jesus Christ. They were bringing the world into the church. Anytime you bring the world into the church you will bring the world’s problems, too. We see that in 1 Corinthians. As we read the book, we soon realize the context has familiar overtones. The city, the people, and the problems the Corinthian church had are not unlike the problems in our world and in our churches today. There are many parallels to find between the Corinthian church and today’s modern church. Several years ago I put together a sermon series that focused on the problems in the church at Corinth. And I tried to present these problems as some of what we face now. I titled the series “Questions from Corinth,” following the idea Paul was answering questions the Corinthian church faced. The sermon series consists of 12 separate messages. For three months we examined the questions asked and what God and His Word has to say for answers. Before Paul begins answering these questions, he spends some time reminding the church who they are in Christ. Many times Christians have a hard time shaking away the ways of the world they come from. Paul wanted to remind the Corinthians they were no longer like the world. The Bible reminds us we are no longer like the world. We have been changed and our world is now God’s world. Sermon 2: What about Divisions in the Church? The church at Corinth was racked with divisions. These factions were a reflection of the different beliefs and backgrounds the people had before becoming Christians. Today, within our own churches, there is always the threat of clashes and divisions among our people. The Bible speaks frankly about divisions within the church. Sermon 3: What about Immorality? The church existed within a very immoral setting. There were some very immoral activities going on between people in the church. Activities that should make people blush. But instead, some seemed to be proud. So Paul addresses immorality. What determines immorality and how immorality affects our churches. Sermon 4: What about the Lord’s Supper? The Corinthians were basically making a mockery of Communion. The Lord’s Supper was affected by the divisions between rich and poor and an overall general misunderstanding. Paul gives the church a stern warning about their actions and the proper way to participate. Sermon 5: Who is the Most Important? The Corinthian church was confused about spiritual gifts. Some of those with more visible gifts began to think they were more valuable to God and the church than those with less visible gifts. Paul addresses spiritual gifts, their origins, and why they are all equally needed in a functional church. Sermon 6: What about Temptation? The people in the church at Corinth, and the people in our churches today all face various forms of temptation. Paul addresses some forms of temptation. He gives the root causes and also how to avoid allowing temptations lead us into sin. Sermon 7: What about the Gray Areas? How do we handle situations not specifically addressed by the Bible? That was a question the Corinthians had and one our people have today. Paul gives us guidelines for dealing with these gray areas. Sermon 8: Is Marriage Important? The practice of marriage was another topic addressed in 1 Corinthians. Is it needed? What is its significance? This question speaks to the heart of many problems in our culture today. God answers these questions through Paul. The love chapter, 1 Corinthians 13, is sandwiched between chapters 12 and 14. Both of those chapters center on spiritual gifts. Chapter 13 is not a random insert, but part of that topic. Sermon 10: What about the Cross? The idea of someone sacrificing their life for others was foreign to a society of self-centered people. What did the cross mean? What was its significance? Sermon 11: What is the Gospel? The word “gospel” was not foreign to the people of Corinth. They understood is meant “good news” or the “good news of victory.” How does this good news relate to Christianity, the cross, Jesus, and the people? Sermon 12: What about the Resurrection? Someone dying and then living again didn’t make sense in the Corinthian world. And it’s rarely understood in our world today. What is the resurrection and why does there have to be a resurrection? How do we know there was a resurrection? And what does it mean for us? The people who made up the church at Corinth had many problems. They needed divine answers. The people who make up our churches today have the same problems and need the same answers. What were the problems in the Corinthian church? The same problems we have today. And where do we find the answers? We find them from the Lord through Paul in His holy Word. 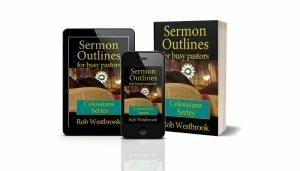 You can find the sermon outlines for these 12 sermons in my book Sermon Outlines for Busy Pastors: Questions from Corinth Series.